The Music Hack Day series, which brings together software ninjas, hardware geniuses and powerful databases to build hundreds of functional music technologies in the course of a single weekend, landed in New York this weekend for a sold-out appearance in Manhattan’s flatiron district on Saturday. Already, the crowd is hard at work. Over two hundred people are currently toiling away on hacks on Saturday, and another 350 have been consigned to the waiting list for a chance to see the demonstrations of this weekend’s hacks on Sunday. Clearly, the event has plenty of draw in New York; it probably didn’t hurt that Hypebot claimed that any seat Music Hack Day is a better than a front-row seat at this week’s Grammy Awards. It’s still too early in the weekend for most of the developers to unveil what they’re working on, but we grabbed a sneak peak of one promising project tentatively entitled Strings — a work in progress from Alex Chen (designer, Google Creative Lab, featured in the video above), Aiden Feldman (web developer, LimeBits), and Tyler Williams (developer, The Echo Nest). 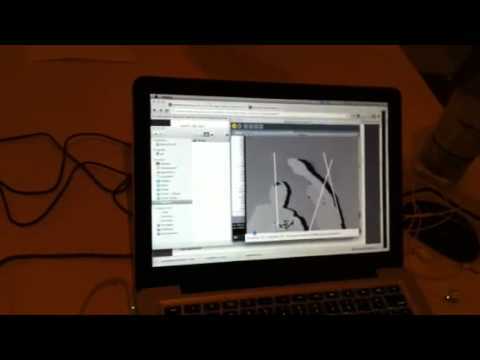 Strings lets the user draw and play an invisible harp in the air around them using, in part, a Microsoft Kinect. Participants begin work on their music hacks Saturday afternoon at Music Hack Day New York (Photo: Eliot Van Buskirk). Strings (again, the working title) grabs 3D spatial data from the Microsoft Kinect and runs that into a Processing program that plays various pitches when the user plucks the invisible strings. The project builds on Chen’s widely-discussed MTA.me web app, which created pluckable strings from subways moving around New York City. We shot the above video only a few hours into Music Hack Day New York, and already, Strings is pretty much up and running. We’ll try to check back and update this with video of the finished version after the event draws to a close on Sunday afternoon.